Dawn McVey is one of my card making heroes. 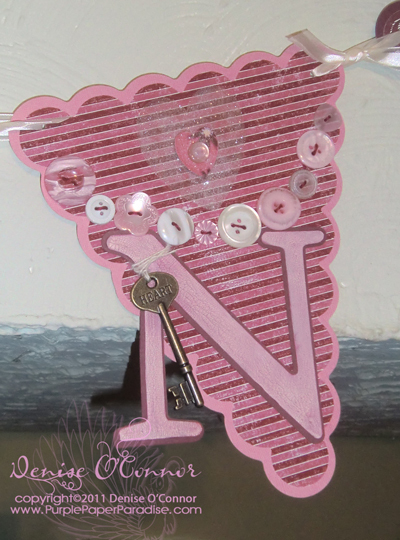 She has such a great eye for color and I have found that she has great instincts for creating cards that are not overly cluttered with embellishments which is a look that I just love! She comes up with some color combinations that initially may not seem appealing, but once you see her creations, you completely change your mind. It is what I call "Out of the Box". 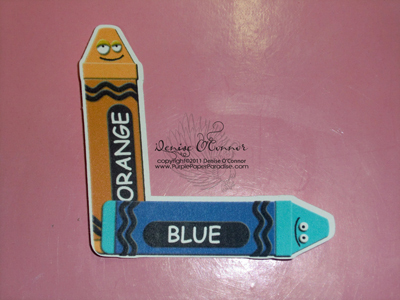 Here is the color combination that she came up with for Papertrey Ink's color combination challenge. Here is a quick, clean and simple card that I created with her colors, and I just LOVE how it came out. It was kind of thrilling to put so little on the card and let the colors take the spotlight. With the recent 4th anniversary of Papertrey Ink, I got so inspired that I went on a card making frenzy! Nichole and the Design Team released some color combinations to try, and there are quite a few of them that I haven't tried. 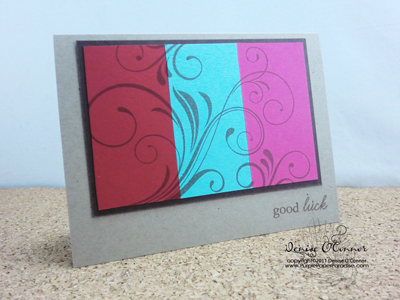 I decided to challenge myself to make one card using each of the color combinations. After trying this color combination, I will definitely be using it again. 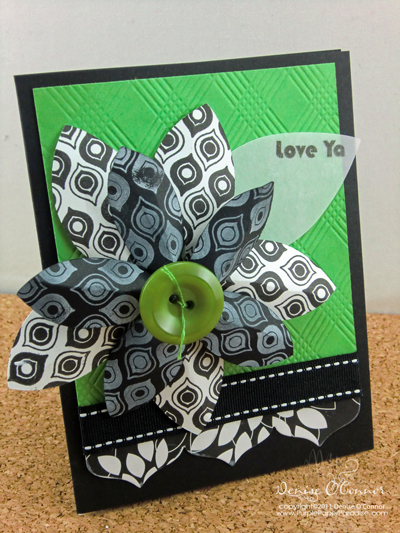 Tomorrow I will be sharing another card using another great color combo! If you are a fan of Papertrey Ink like I am, then you may already know that they have started a weekly challenge called Make It Monday. I didn't get to participate in the first one, but I just had to make sure to get in this week. 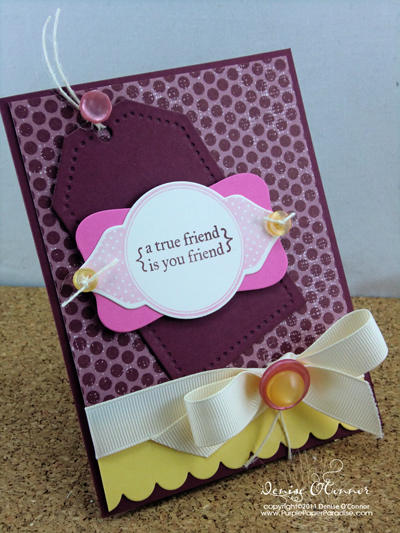 Our challenge this week is to add a vellum sentiment to our card. I decided to add my sentiment to a vellum leaf. This color scheme just screamed Just Mod stamp set, and I love the way it turned out! The Picnic Plaid impression plate really adds to the card as well. I really like the way these turned out! I did make some minor changes to the dinosaur just to eliminate some of the layers so that I could assemble these faster. I also decided that instead of cutting out the sentiment, that I would print it directly onto the cardstock topper. The green border was done with the small rick rack die from Papertrey Ink. All of the goodies were placed in a glassine bag and then I put the topper on. I like to do a mix of goodies. I add a couple of pieces of candy, but then I included a notepad and pencil, some dinosaur toys, and a small tube of bubbles. 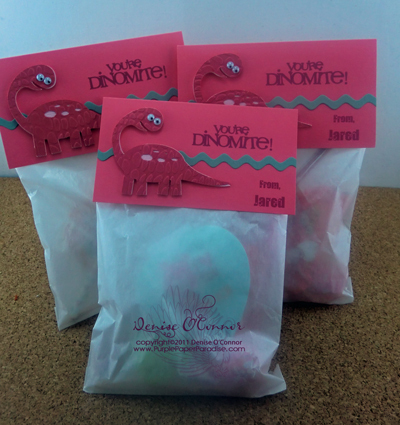 Now for the teachers, I used the same dinosaurs that I had on the goodie bags. 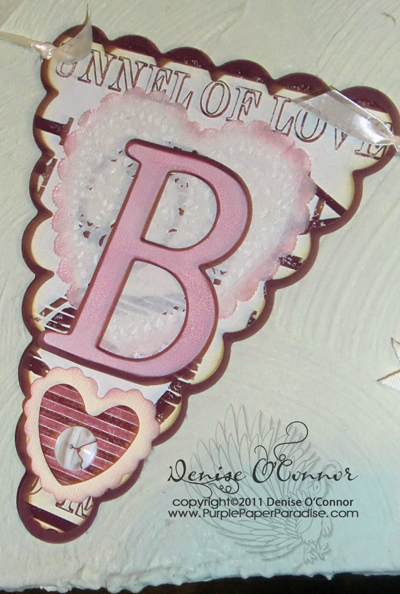 The card and envelope came from the Card B and Envelope B SVG set from Lettering Delights. I used Barn Door and Crushed Olive Distress Ink on the background and then heavily spritzed it with Perfect Pearls Mist in Kiwi. For the mat layer, I used the Mat Stack 3 die from Papertrey Ink and I used the Just the Ticket stamp set again for the sentiment and background. I forgot how much I like that stamp set! 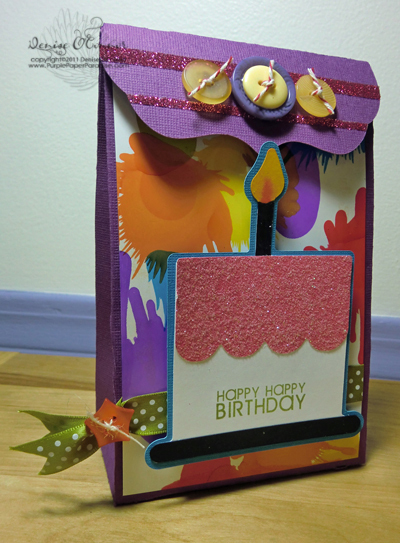 I started off by using an oval Spellbinders die and die cut it out of Aqua Mist cardstock. I then cut off part of the bottom and the sides. It's hard to see in the picture, but I stamped in Versamark several love related sentiments. 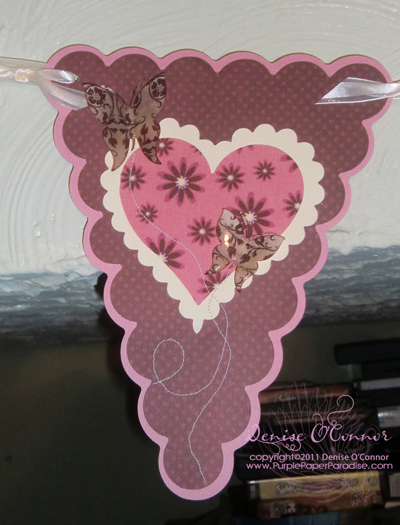 I then added a strip of Plum Pudding cardstock and put a pretty bow around the raw edge in Vintage Cream Satin Ribbon. I then die cut a piece of Distressed Dots paper with my Mat Stack 3 die. I then took a piece of Vintage Cream cardstock and used my Just the Ticket stamp set to create a background and then punched out a circle of this. I swiped the circle with the Vintage Tea Dye duo and attached it with foam dots. 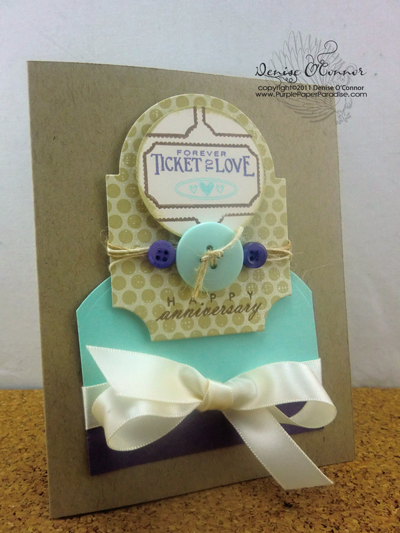 I stamped a Happy Anniversary sentiment along the bottom directly on the die cut and then added the buttons and twine around the middle. Tomorrow I will be sharing all the Valentine's Day goodie bags and Valentines that I made for my son's class. They turned out really cute! Print & Cut with the eCraft! If you have Make the Cut, you can Print & Cut your graphic files! When Make the Cut added this feature a few months ago, I tried it with my Cricut, but quickly got frustrated! The problem that I had is that my Cricut is not aligned correctly and therefore my cuts were always off. When Make the Cut added the beta plug-in for the eCraft, I decided to have another go at it, and I figured it out this time. Kay at the Clever Someday blog was incredibly helpful with THIS post on the MTC forum. On this post you will find her instructions for doing this with the Cricut, and I highly recommend that you download it because it is incredibly useful! Remember this picture from the other day? This was all done on the eCraft. The graphic is from the Lettering Delights Smiley Supplies Graphic Set. 1. Since we don't use a mat like the Cricut, we have to make sure that we load the paper into the tray the same way. When you put a piece of paper in the tray, it is not a snug 12" wide fit, meaning that there is a little gap. Always load your paper so that it butts all the way to one side!! This method will NOT work in front/manual mode as there is no good way to standardize how the paper is loaded every time. 2. Cut the 4" square that she recommends, but instead of having a 1" margin around it, do a 2" margin instead to make sure to properly accommodate for the rollers. That way we know that the variance is not affected by the paper sliding because the rollers lost their grip. 3. After cutting the square and verifying that it is a true 4" square, measure the margins. This is where it gets tricky. Write down your measurements and then calculate the difference in those measurements and 2". These measurements will be your offset. For example, let's say that your left margin is 1 5/8" and your top margin is 2 3/16". For your left margin, you need to add 3/8" (0.375) to get to 2" and for your top margin, you need to subtract 3/16" (0.1875) to get to 2". 4. To test these measurement, import a simple graphic per Kay's instructions. Set your graphic's coordinates at X 2.0" and Y at 2.0". Print your graphic. After you have printed your graphic, change your coordinates so that you have added or subtracted your offset. So from our example above, your cutting measurements would be X 2.375" and Y 1.8125". Cut your image. A couple of tricks that I have found, don't expect perfection. There is always some variance, and I have found that this works best when done with a Shadow Layer so that you have a white border around the graphic. Picking which graphics you are going to use is key! If you pick something that is intricate and has a lot of flourishes, you probably won't be happy with the results unless you add a big shadow layer on it. I also used a cardstock stabilizer with this method because that will make sure that the paper is tightly held in the rollers. If anyone needs me to explain something better, please leave me a comment below, and then I will edit this post to include any additional information. One last Craftwell CHA Booth Project! A few weeks ago, Craftwell sent out an e-mail looking for projects made with the eCraft to be displayed at their booth at CHA! At the time, I was working on a Valentine's Day Banner and I decided that I would send it off to them. Well they decided to display it in their booth! How about a few close-ups? All of the scalloped banner shapes were cut from the Jen Allyson Celebrates SD card at 8 1/2 for the top layer and then cutting a shadow for the cardstock base layer. The top layer of this banner was actually cut from some fabric that I found at Joann's. 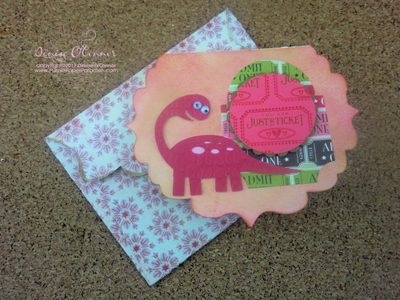 It was a perfect match to the Core'dinations cardstock colors that I had picked! The butterflies here were cut from the Fundamentals 1 SD card. After cutting them out I coated them with UTEE to make them stronger but also add that shine! I bent the wings up a bit to add some more dimension. I also used my sewing machine to stitch the trails. 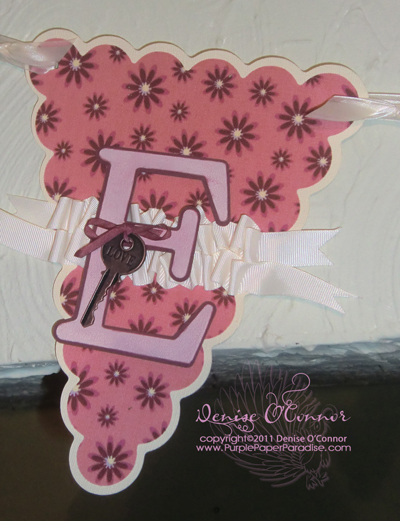 The stamp used on top of that medallion is from the Signature Series: Flower stamp set from Papertrey Ink. I just love that saying and knew that I needed to use it! 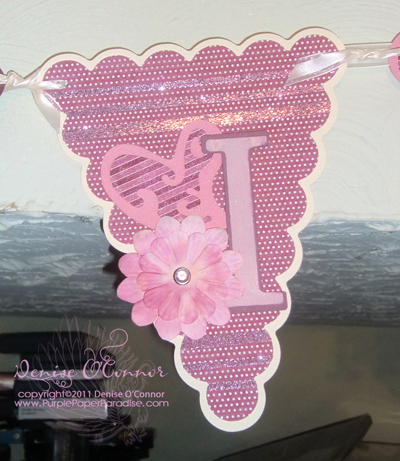 I added these glitter lines using Scor Tape and Martha Stewart glitter. The flowers were colored with Distress Inks. Do you see that glittery see-thru heart above the button border? I did that by cutting a sheet of Terrifically Tacky Tape in the eCraft so that I was left with a die cut of adhesive. After putting that on my background paper, I added some Extra Fine Glitter to it. I love how that turned out! That pink heart was created by cutting a piece of clear plastic and then coloring it by airbrushing it with some Copic markers. I then stamped it with some white Staz On ink (Fancy Flourishes stamp set from Papertrey Ink) and then I dabbed the whole thing with some Perfect Pearls. Also, all of the letters on the banner were cut out of cereal box chipboard and then a shadow layer cut from the cardstock. 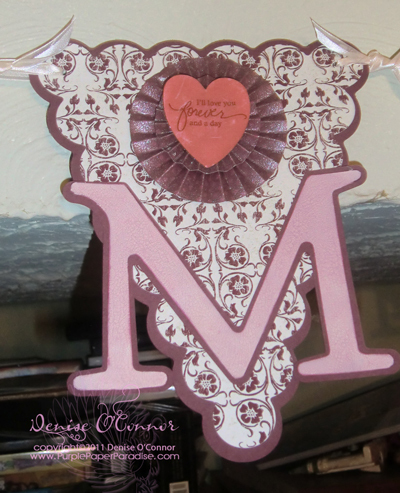 I coated the chipboard letters with Distress Crackle Paint (Tattered Rose) and then once dry, I added some Victorian Velvet Distress Ink on it to make the cracks stand out some more. 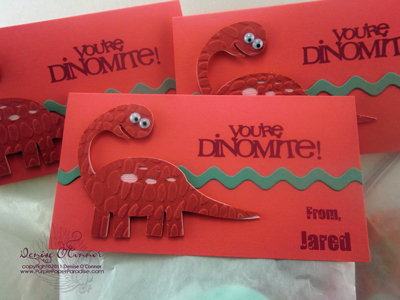 All of the cardstock is from Core'dinations. The patterned papers are Bo Bunny Wine Dot and digital papers from Lettering Delights Valentine Game Night Collection. Have a great day everybody and be sure to come back tomorrow, because I am working on something that I think all of you eCraft users will like! Can you guess what I was able to accomplish?? Here is a video that I did on two different ways that you can cut scraps using the new beta plug-in for Make the Cut made especially to allow cutting to the eCraft machine. Hope you all enjoy it! On a side note: We are in the middle of a blizzard right now. It started about 2:30 this afternoon and the Blizzard Warning is in effect until 3:00 tomorrow afternoon. School was cancelled for tomorrow, and I suspect that a lot of businesses will be closed as well. The last time we had a blizzard like this was in January 1999 and it closed most businesses (only the grocery store and video store were open) and it took days for everything to return to normal. As I am writing this we are experiencing some power surges so I will not be surprised if we lose power here (as the worst of the storm passes through). Due to this, I may not be able to respond to any e-mails as quickly as I would like to, but I will respond as soon as I am able to do so. I wanted to drop in and share with you two more projects that were on display in Craftwell's booth at CHA that I made. This first box was made with the Pinch Box collection from Lettering Delights. The birthday cake embellishment is cut from the Jen Allyson Celebrates SD card. This box was super quick to put together and I just LOVE the background paper that I made using Glossy Cardstock, Alcohol Inks, and a can of pressurized air. I will definitely be doing this again! So much fun! 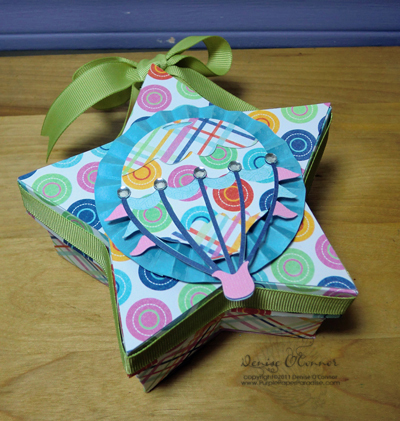 The next box was created from the Vintage Paper Rosettes collection from SVGCuts.com. Love their stuff and now that MTC is working well with the eCraft, I know I will be using more and more of their files! 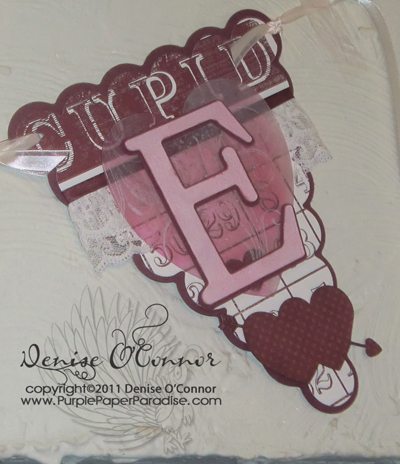 The hot air balloon was made from the Balloon Craze collection at Lettering Delights. I know that I promised all of you another video today on MTC, and I am going to do my best to get it done today. Unfortunately yesterday was a rough day for me. First off I feel a cold coming on, and I am just hoping that it is not the same cold that my husband and kids had last week because that cold lasted for a week! I know...I think it is a lost cause, but I always try to be positive so that is what I am doing. The other thing that caused a glitch in my plans was that there is a blizzard heading toward the Windy City (like we need more wind!) and so yesterday I headed out to the grocery store not once but twice to stock up on everything that we may need. We are expected to get up to 24 inches of snow (yes 2 whole feet...yikes! ), so I needed to make sure that we had enough supplies in case we are "snowed in" and also in case we lose electricity. I had to go twice because at the first store I realized early on that I was not going to be able to fit everything in my cart that we needed, so I had to go home and drop the first load off and then head out again. That really wore me out as I wasn't feeling good anyways. The snow isn't expected to start until this afternoon, and I do have to get to the pharmacy to get a prescription for my hubby, but after that I am planning on spending the rest of the day at home, so hopefully I don't get too stuffy and can get it done!